It's that fun time of year when everyones kids are sick and are constantly whining. I can't believe I actually got a picture of them both smiling. This is a very rare occasion and I thought it was cute. We just got over the sickness but it was me that was the whining one. 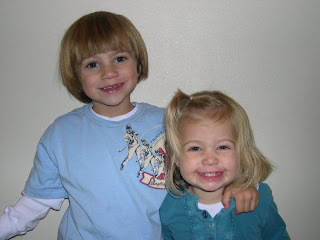 Your kids are so dang cute! so cute - don't ya wish they would have smiled like that today!!! I Love that picture:) Zoey cracks me up shes a little goof ball. Cute kids! I miss seeing you guys. whens the house going to be done? They do look so cute! K sorry to be so annoying about your house but I actually drove by it today and it looks amazing! Oh my gosh I'm dying!! Jake and Zoey are sooo cute! There getting so big! Give them a hug for me please!